A while ago I came across a tweet by Louise from Sew Scrumptious about “Dress a girl around the world”. She is the UK coordinator for this charity which aims to provide little girls in need with proper dresses. Having a dress is not only a matter of looks, it is also a way to show these girls are cared for: this is comforting for them and discouraging for possible predators. 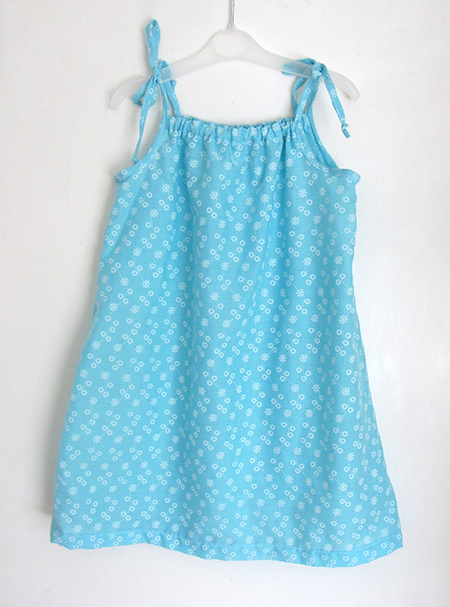 I immediately loved this idea and picked a pretty flowery blue cotton to make my first dress. On top of being for a good cause, this allowed me to practice my top stitching: I wanted the dress to be perfect! I will surely make some more because they are quite addictive to make. What about you join in? All information (including links to patterns) is available on Sew Scrumptious dedicated page. Love the dress and you picked a great fabric. I’ve made a few pillowcase dresses for charity before and am about to make some again for another project I just found. They’re great fun to make aren’t they? I found some pillow cases I don’t use anymore in a lovely blue, it will be two more dresses soon! Thanks for letting me know Meagan. I plead guilty as I haven’t checked the blog on IE in ages. Will check this out.